An average woman uses twelve personal care products each day, exposing herself to 168 unique chemicals. These products don’t always remain on the skin’s surface. Many cosmetic ingredients penetrate the skin. This means you could be unwittingly exposing yourself to chemicals like formaldehyde, phthalates, and parabens, which have been linked to cancer, birth defects, and hormonal chaos. That’s why this week we are diving deep into the truth behind the beauty industry with Kevin Gianni, co-founder of Annmarie Skincare. Melissa & Jasmine Hemsley radiate health and beauty - you can't miss it when you see them. Which made me wonder - what's the secret behind their effortless radiance? 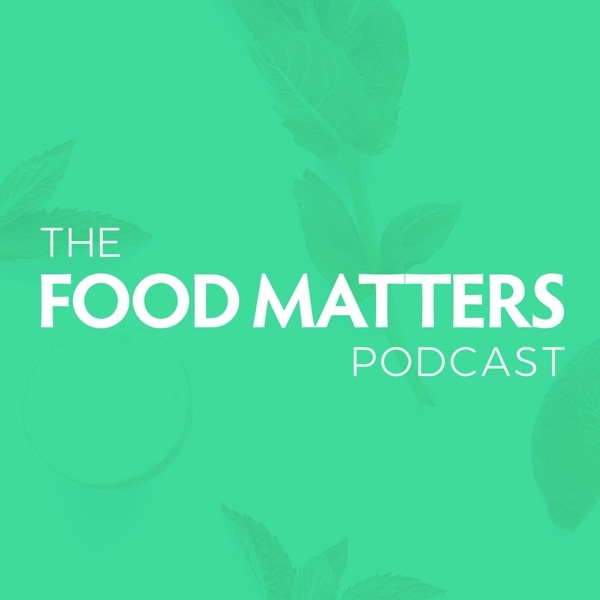 In episode 15 of the Food Matters Podcast, Melissa & Jasmine spill their secrets for better digestion and beauty. These women are all about eating wholesome food, ethically sourced, and love returning to their Filipino heritage for recipe inspiration. This food-loving, power duo are taking the world by storm with their down to earth approach to eating and nourishing your body. And, how your intentions and actions can help you heal. Imagine how you’d feel if, by making simple changes, you could start to sleep through the night, waking up fresh and energized. If you’re finding it difficult to get a good night’s sleep you’re not alone. In fact, you’re now in the majority. A recent survey in the US found that 52% of the respondents were classified as “not good sleepers”. Like you, there are many people around the globe tossing and turning their way through the night, and stumbling their way through the fog of the following day. This week's podcast episode dives deep into what helps us to sleep with Tom Cronin from The Stillness Project. How to address why the nervous system is not allowing you to sleep naturally. How to apply meditation to assist the sleep process. Simple and practical tips on how to get a good night's sleep. Remember when you used to be that person who didn’t know what they wanted? The one who just moved through the motions, attended parties, hung on to the toxic relationships, went to a mundane job - just for a paycheck, ate anything out of a box and participated in the daily grind. But inside were screaming and reaching out in vain to break free from what had become a vicious cycle? Break free from this cycle and learn to liberate your life, strip off the fear, wash away the self-doubt and dress yourself in health, wealth and love in this exclusive interview with Melissa Ambrosini. In this exclusive interview, join James as he chats with Dr. Mark Hyman about why we are all so confused about food and nutrition. He explores the foods we should and shouldn’t be eating as well as practical advice on how to use plants as medicine. Dr. Mark Hyman is the Medical Director at Cleveland Clinic’s Center for Functional Medicine, the Founder of The UltraWellness Center, and a ten-time #1 New York Times Bestselling author. He believes that we all deserve a life of vitality and that we have the potential to create it for ourselves. Foods people think are healthy but should be avoided? When people choose a more plant-based diet, they often have a panic, thinking, "where will I get my protein from!?" The good news is that meat is not the only source, nor is it the best source! In this exclusive podcast interview, join James as he chats with Elizabeth Rider about where to get protein, calcium, and other major nutrients when going plant-based. Elizabeth is a certified health coach, popular international food blogger, and plant-based expert. She loves making healthy delicious and easy. She has studied at Cornell University's plant-based nutrition program and at the Institute for Integrative Nutrition, working to better understand just what it is our bodies need to truly be healthy and thriving. In this week's podcast interview you’ll discover why sleep is crucial for hormone regulation and how you can use visualization for weight loss. Have you ever had difficulty waking up in the morning, or had a lack focus and mental clarity? Or maybe you feel tired all the time and can't figure out why! Chronic Stress and adrenal fatigue is an invisible epidemic that millions are suffering from around the world. It's the result of mental, physical and emotional stress. This week’s Podcast episode is dedicated to Charlotte Gerson. Just last week, Charlotte Gerson passed away, one month shy of her 97th birthday. She was a champion in the natural health and wellness movement, helping to continue the legacy of her late father’s work, Dr. Max Gerson, who discovered and developed the Gerson protocol. The natural healing protocol help to heal himself from XYZ and others who were going through chronic end-stage disease and even Cancer. Dr. Gerson story is an incredible one, captured in this full interview with Charlotte when we were filming the Food Matters Documentary. It’s amazing to think that when we conducted this interview, Charlotte was 86 years old, and an absolute powerhouse, driven by sharing the work of her father. Charlotte - your tireless support that you dedicated to natural therapies and continuing your father’s legacy defied your age. We will forever continue to share your films with the world. Rest In Peace Charlotte Gerson. Gluten - can it really be that bad for you or is it just another trend?? It's time for some answers! In today's episode, we'll be getting to the guts of the issue, once and for all! We have a fantastic interview with Dr. Tom O'Bryan, discussing how a lot of people think “gluten free” is just another fad diet and why this couldn’t be further from the truth. Dr. Tom O’Bryan is a clinical practitioner with over 30 years of experience in the field, teaching 1,000s of practitioners himself, he is regarded as the Sherlock Holmes of chronic disease and digestive disorders. What gluten sensitivity and celiac disease really means? Do you feel like, no matter how hard you try, you can't lose that stubborn weight, you can't seem to get the sleep your body's craving, or your moods seem to be all over the map?! We get you! Better yet, Dr. Libby Weaver gets you! In this episode, Dr. Libby Weaver, one of Australasia's leading nutritional biochemists, author, and speaker, explains exactly what stress is doing to your body emotionally and physically AND she tells you how you can break through that burden of stress to start living! The ripple effect on your life due to long-term stress and the role of cortisol in your body. Living in the sympathetic nervous system; and how it plays havoc on your weight. management, food cravings, sleep quality, patience, moods, self-esteem and overall quality of life. Realizing that the way we eat, drink, move, think, believe and perceive impacts our need to rush. Becoming aware of why you do what you do and work out what led you there. John Robbins is a 3-million copy bestselling author, social activist, and humanitarian. President and co-founder of Food Revolution Network, aimed at helping you make life choices that enhance your health, nourish your spirit and make the most of each stage in your life’s journey. His book ‘Diet for a New America’ helped my Mum and I begin to transform my Father’s chronic illness at the beginning of creating Food Matters. After an incident in kindergarten, Jim Kwik had countless learning difficulties that led him to being labeled “the boy with the broken brain”. This label left a long-lasting imprint on his self-worth, his identity, and beliefs in himself. Learning became his greatest mountain that he saw as an impossible climb. Having made it into university after years of struggle, Jim found himself at the same place he’d always been - incapable of scholarly success. Ready to succumb to the doubts within himself, Jim planned to quit school. It was in this time that Jim met someone who challenged the way he perceived his potential and changed his life forever. Firstly, he asked Jim to write down his aspirations on a piece of paper pulled from a journal that he had in his pocket. He then gave Jim the task to read one book per week about any great man or woman throughout history, plus personal development books - all while he was still completing his university. With the fear of failure taking over, Jim said, “I can’t do it”. This man immediately took the folded piece of paper from Jim’s hands and read his goals out loud. “Something about hearing your dreams come from a stranger’s voice… it shook my heart, it shook my spirit, my soul, something fierce” - those goals became the motivation he needed to push himself and to finally believe in himself. Today, Jim uses his experience of shattering those limiting beliefs to help others break through similar barriers and get their brains to reach their full potential. What belief do you have about yourself that are holding you back? Are you ready to break through that belief and make the impossible, possible? James and Dr. Axe discuss the answers to one of the modern day's biggest health ailments, a dysfunctional gut. The pair explore topics relating to leaky gut, irritable bowel syndrome & Crohn's disease and discuss how we can use natural remedies and nutrition to treat and fight against the root of these issues. Along with nutritional treatments, Dr. Axe also touches on the act of grounding, microbiome uptake and the benefits of mindful eating. It’s a must watch to discover more about this foundational aspect of our health! Marie Forleo, NY Times best-selling author, life coach, and host of Marie TV, guides us through getting rid of those beliefs that could be holding you back. It is our beliefs that drive our actions, and our actions drive our destiny, so our beliefs are actually of paramount importance.